If you think a bathroom isn’t a bathroom without a tub, think again. In today’s modern bathroom design, showers are “in.” In fact, there are several reasons why getting rid of the bathtub for a shower can be not only an acceptable, but preferable choice. Consider this: showers maximize convenience, save space, serve seniors who want to age in place, and more. That’s why, for many homeowners, choosing a shower instead of a tub is the smartest choice for their lifestyle and needs. What makes a shower a smarter choice? When should you consider ditching the bathtub for a standalone shower? 1. You have a small space. Showers take less space than tubs, and, as such, they’re smart choices in small bathrooms where space is at a premium. By opting for a shower instead of a tub, you gain floor space without sacrificing the value of a full bath. Whether you’re re-imagining an existing bathroom in your home or looking for ways to maximize the floor space in a new bath, going with a shower means making the most of a small bathroom. 2. You’re turning a closet into a bathroom. Along the same lines as working with a small bathroom, when you want to convert a closet or part of a room into a bathroom, you’ll reap several benefits by going with a shower. The shower will fit better into a reconfigured space, without making that space feel cramped. 3. You want more efficiency. Generally speaking, showers save water and energy, as compared to baths. That’s because the average tub requires 25 to 45 gallons of water, whereas a short shower with an efficient showerhead uses half that amount. Saving water is not only good for the environment, but it’s also good for your pocketbook, as it cuts costs overall for your household. 4. You want greater accessibility. Individuals who are disabled often have a hard time getting in and out of a bathtub. Likewise, elderly homeowners typically find themselves needing a shower with a curbless or roll-in design as they age. Make your home more accessible — and easier for aging in place — by creating a shower that accommodates easy access. 5. You care about safety. The sad reality is that climbing over a bathtub is an easy opportunity for accidents to happen. Showers, on the other hand, can include all kinds of safety-boosting features, from seats to grab bars. If safety is a concern for you now or in the future, a shower has several advantages. 6. You want an option that’s easier to clean. Anyone who’s regularly had to clean a bathtub knows the frustration of scouring scum. With a shower, you can get a hand-held showerhead that makes it easier to rinse debris. 7. You like showers better than baths. For every person who loves a long soak in the tub, there’s another who prefers a quick scrub in the shower. If a shower fits your lifestyle better than a tub, it only makes sense to choose it for your home. 8. You want big luxury in a small space. Opting away from a tub doesn’t mean opting away from luxury. A shower can have just as many comfort-enhancing options as a tub — maybe more. Consider the benefits of rain heads, body sprays, built-in shelves, in-shower music players and other features designed to create luxury living with a shower. Part of knowing whether you’d prefer a shower or a tub is about considering your lifestyle and preferences. The other part is recognizing all the benefits available from a shower in your home. Whether you’re looking to save space, increase accessibility, conserve water, age in place or just give yourself the kind of daily bathroom experience you prefer, a shower can be an excellent option. When you’re looking to update or build a bathroom with the best features in the marketplace, come to Modern Bathroom. As the Internet’s leading provider of factory-direct pricing on bathroom fixtures, we have everything you need to remodel or design the perfect bath. Shop our online catalog to learn more about shower door enclosures, shower head sprays and more — all available at prices that save you up to 70 percent off retail costs, with free shipping throughout the 48 contiguous United States. Shop our catalog today to find great shower fixtures. Or, get in touch with our team to discuss possibilities! Framed or frameless, a new mirror can change the entire look of a bathroom, making it more functional as well as stylish. That’s because the mirror is a vital part of the bath — the place where you wash your face, brush your teeth, do your hair and check your makeup. When you make it a beautiful feature, it impacts the whole space. Are you getting ready to swap your bathroom mirror? Want tips on how to hang it right? 1. Heavy mirrors require special care. Hanging a mirror is a lot like hanging a large picture frame or a big piece of art. When it’s a large, heavy piece of glass, it needs brackets or wires to support it on the wall. If it’s frameless, it may require special clips or adhesive to stay in place. 2. You want to know the type of wall. Before buying hardware to hang your mirror, think about what type of wall you have, as this will impact the way you hang your mirror. Is it drywall, plaster or masonry? If you aren’t sure, try pushing a small tack into the wall. If it’s drywall, the tack will go in easily. Likewise, locate the spot on the wall where you want to hang your mirror — over a stud is helpful, but not required if you use anchors. Pay attention to where utilities might be attached, and mark the center of the stud. 3. You want to know the mirror weight. You’ll need to know how much your mirror weighs in order to know if your hanging hardware is sufficient. If you don’t already know how heavy your mirror is, weigh it on a bathroom scale. Your hanging hardware will likely indicate a weight limit. Hold your mirror up (or have someone else hold it up) where you want it to go, and use a pencil or painter’s tape to mark the center of the top edge. Does the back of your framed mirror have rings or wire already mounted for hanging? This will show you where your hooks can attach. 3. Mark and measure the mirror. Stick some tape on a level and mark it with the space between your mirror’s rings, if applicable. Then, measure from the wire or the rings to the top of the mirror. Using the amount you just measured, mark the wall below the previous mark from the top center of your mirror. 5. Level hook mounting holes. If you’re using a mirror with rings or hooks, make sure your marks are level on the wall before mounting the mirror. If you’re mounting on a stud, secure the hardware there. If you’re mounting elsewhere, secure a wall anchor with the hardware. Hang your mirror on the hardware. If you’re concerned about scratching the wall, you may want to add bumpers to the mirror’s bottom first. As with a framed mirror, start by holding up your mirror (or having another person do it for you) to mark where it should be hung. Using a pencil, outline the top, bottom and side edges of the mirror. 2. Mark top and bottom edges. Set the mirror somewhere safe and mark the edges of your mirror — about a third from the left and right on the top and bottom of where your mirror will go. Place mounting brackets at the two bottom places where you just marked and screw them in. If you’re mounting on a stud, you can put the screws directly into the wood. If you’re mounting elsewhere, you’ll need to use a drywall anchor. 4. Slide in your mirror. After mounting the brackets, slide your mirror into them, and line it up. Last, screw in the brackets at the top of your mirror. To make the most of your bathroom update, be sure you take time to properly install your new mirror. Use the tips above to ensure your new look lasts well into the future. To find quality mirrors for your refresh, visit Modern Bathroom, the Internet’s leading resource for bathroom products at factory-direct pricing! In small bathrooms where space is at a premium, a single-sink floating vanity is the best choice. Offering a simple and modern look, this type of vanity is a good fit. It provides a single prep area and exposes more floor space for a larger look and feel in the bathroom. As with other vanities, floating vanities are available in various styles and materials, from traditional to modern. They also come in varying widths, allowing you to accommodate your space appropriately. For larger bathrooms, a double-sink vanity is a great addition. Two people can get ready for the day at the same time. Despite the double-duty capabilities, this style of vanity creates a cohesive look in your bathroom space. Dual floating vanities are matching — but unconnected — vanities that attach to the wall individually. Stylistically, installing dual vanities can be a great way to highlight your chosen vanity style. Say you choose two rich wood vanities with granite tops and vessel-bowl sinks, for example. The twin vanities draw extra attention to the attractive, floating design of your pieces. Another stunning option is a wall-to-wall floating vanity that spans the full width of a wall in your bathroom. Thanks to the extended length, this style of vanity feels more like furniture than a simple fixture. Its floating design creates a minimalist look that works beautifully in both modern and traditional bathroom designs. After you determine your preferences, you can explore all of the different designs — from marble-topped, single floating vanities; to gray oak, double floating vanities with solid-surface counters and vessel sinks. In every case, when you incorporate a wall-hung floating vanity into your bathroom, you get to enjoy a streamlined look that enhances your overall bathroom design. To shop modern vanities that let you outfit your bathroom with style, visit ModernBathroom.com. Part of the HMS Stores Network, our company provides factory-direct pricing to save you up to 70 percent on bathroom products. On top of that, we offer free shipping throughout the 48 contiguous United States. Browse our catalog online to find your favorites. 1. Go bold with design choices. A small bathroom is the perfect place for big style. Why? Consider this: A small area costs less money to update than a big one, so it’s a great place to test out a large tile or bold paint. Likewise, you spend less time in the bathroom than you do in your home’s main living areas, so you’re less likely to get bored with or tired of its style over time. To make the bathroom especially impactful, try covering the walls with wallpaper you love or painting it a bold color such as midnight blue. Instead of shrinking the mirror size in a smaller bath, opt for a larger, bolder style that bounces more light around the room. 2. Choose the vanity wisely. If your small bathroom is just a half bath for guests, you may be able to get away with a pedestal sink that lacks storage space. If it’s a main bath, however, make sure you pick a vanity with room to store toiletries and linens. Even the cutest bathroom design will be frustrating if it doesn’t work for your needs. That’s why you need a vanity that can accommodate necessary items. One great option to consider is a floating vanity, which provides storage space, yet frees up floor space to create a larger feel in the room. 3. Consider a seamless glass shower. If it’s a small full bathroom you’re working with, consider swapping out the shower/tub or space-hogging shower insert with a glass-enclosed shower instead. Glass shower doors can create a seamless look, visually expanding the sense of space in the bathroom. 4. Think practically about storage. Places other than a vanity can hold everyday products and linens. To make your bathroom useful, try to also incorporate clever storage options through features such as a shower niche, wall shelves, attractive baskets, a vertical ladder, etc. If you’re unsure which storage features to include, start by thinking about how much you need to store, and then create storage space to suit it. A small bathroom can get cluttered quickly. When space is in short supply, it doesn’t take much to fill it. For this reason, you must be intentional about what you keep in a small bath. The items you keep out on the vanity, for example, should be chosen with care — pieces that are useful as well as beautiful. Ask yourself what’s actually necessary and what can go. Get rid of everything that doesn’t fit in your bathroom — extraneous towels, cosmetics, etc. 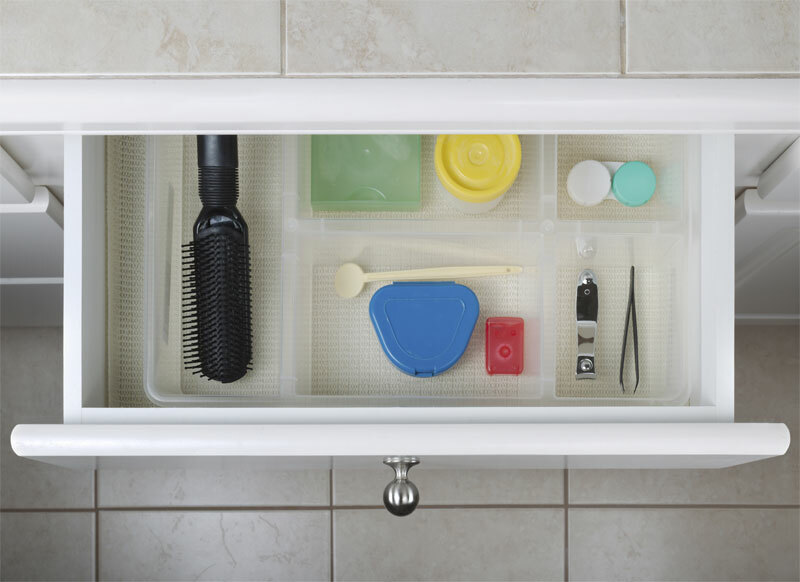 By focusing on what’s most important in the bathroom, you can better organize and keep it looking clean. In a small bathroom, where each little addition is an important one, little luxuries make a big difference. 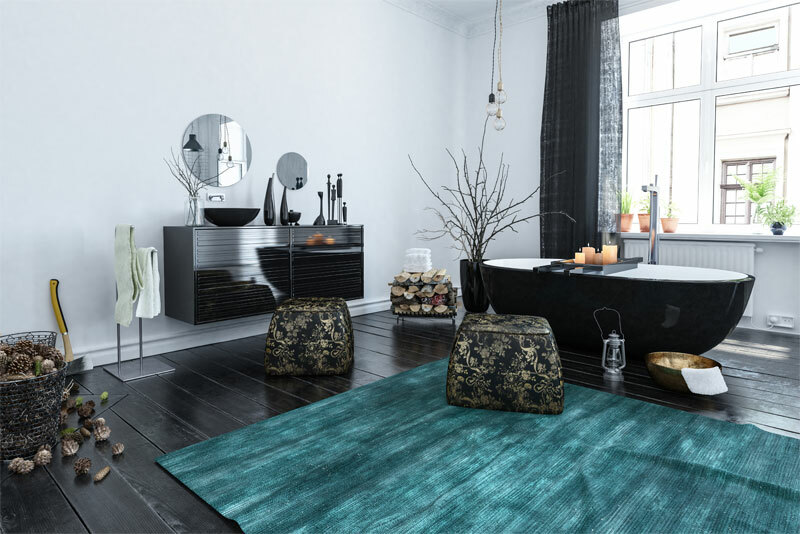 Some great ideas for intentional luxuries include spa-quality hand soap, a tasteful plant or vase of greenery, plush towels hanging on hooks or racks, a towel warmer, and neatly organized toiletries in eye-catching storage containers. When it comes to a small bathroom, every perceived limitation is actually an opportunity — a chance for you to make a statement and create a bold look. So when you’re brainstorming ideas for the small bathroom in your home, start with the ideas listed above. When you incorporate strategic design choices into your bathroom, you can make it a more attractive place. More than that, you can make it a selling point if that’s your goal. To learn more about great bathroom features and to shop a selection of products offered at low, factory-direct prices, visit ModernBathroom.com. As the leading online resource for bathroom products at competitive prices, we’re here to offer you everything you need to complete your small or large bath. We have two showrooms in California and offer free shipping to the 48 contiguous United States. Contact us today to learn more. A good shower can help you get moving in the morning, or refresh you after a good workout or long day of work. That’s why dealing with a shower with low water pressure can be so frustrating. When water is trickling instead of spraying, you may have to scrub harder and wash longer — and the water may feel colder because it’s covering less of your skin surface. Does this sound all too familiar to you? Are you dealing with low water pressure in your shower and wondering what to do about it? If so, read on for more information on a few things you need to know. Determining the cause of poor water pressure is worth the trouble. An obvious reason is that you want to know that the root issue isn’t something that will lead to bigger problems down the road. Proper water pressure also makes for more efficient water use and more enjoyable showers. Fixing poor water pressure starts with understanding what has gone wrong. Whether your water pressure is too high or too low, it’s a red flag indicating something isn’t working as it should. There’s no better time than now to figure out what’s going on. Too much demand on the water supply. If you’re in the shower while the dishwasher is running or the toilet is being flushed, your water supply is being directed to two different places. The pressure is basically being diluted, and some of the water that would have gone to the shower is being sent elsewhere. If your shower water pressure increases and returns to normal when no other water is being used, this is probably the issue. Solution: Don’t run other water when you’re in the shower. The shower head is blocked. If the shower is alone in experiencing low water pressure, no matter how many faucets are running, the problem could be a blocked shower head. Solution: You likely will have to unscrew the shower head to remove it. Check to see whether there’s an obstruction preventing water from flowing freely. Remove any sediment by soaking the shower head in a bowl of vinegar overnight and pushing obstructive material out with a toothpick. Alternatively, you may have to replace the shower head. You have a water-saving shower head. If the problem has existed since you moved in, it’s possible you have a water-saving feature in the shower head and weren’t aware of it. These shower heads are designed to lower water consumption, which may also mean lowering the water level pressure. Solution: Determine whether you have a water-saving shower head installed. If so, replace it with a standard shower head. Your water main is leaking. A larger-scale issue that can affect shower pressure is a problem with the water main. If it’s not all the way open, if the main is leaking or obstructed, or if there’s a related equipment malfunction, the water pressure throughout the house likely will be affected. If you just bought a new build, the water main may not have been opened all the way. Similarly, if you just bought an existing home, it’s possible previous owners adjusted the water main to try to reduce household water consumption. If you’re dealing with a leak, you could be paying for water you don’t even use. Solution: Ask your water provider to check your water main for leaks, as well as the shut-off valve on your water meter to see whether it’s turned all the way to the “open” position to maximize water flow. A nice shower is one of life’s little luxuries. So is having a bathroom that features quality fixtures and design. Whether you’re updating a bathroom, upgrading plumbing fixtures or adding accessories, a great resource is modernbathroom.com. As the Internet’s leading provider of bathroom products at factory-direct prices, Modern Bathroom is pleased to offer affordable items, free shipping and a low-price guarantee. We’ll refund 110 percent of the difference if you find something you buy from us at a lower cost within 30 days. Whether you’re swapping out a shower head or overhauling your entire bathroom space, we’re your resource for getting it done at affordable prices, with quality products. Are you interested in updating your shower or other aspects of your bathroom? Check out our full catalog of quality, brand-name bathroom products at modernbathroom.com. And if you have any questions, contact us anytime to learn more about our quality showers, shower heads, glass enclosures and more.